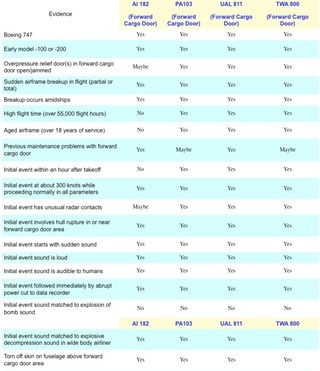 Miscellaneous Information on Boeing 747, fatal accidents, hull losses, and cargo data. Shorted wiring/forward cargo door rupture/explosive decompression/inflight breakup explanation described in pictures, text, and drawings for United Airlines Flight 811, Pan Am Flight 103, Air India Flight 182, and Trans World Airlines Flight 800. Four early model Boeing 747s (747-100 and 747-200) have experienced a sudden explosive decompression which have resulted in fatalities. The sudden loud sound of the initial event was recorded on the cockpit voice recorders (CVR) and after analysis a bomb sound was ruled out. The model for the other three accidents is United Airlines Flight 811 which experienced the same sudden loud sound but was able to land largely intact. The evidence United Airlines Flight 811 matches in many ways the evidence of the other three. The official probable cause for UAL 811 and in the opinion of this independent investigator is the same for AI 182, PA 103, and TWA 800. 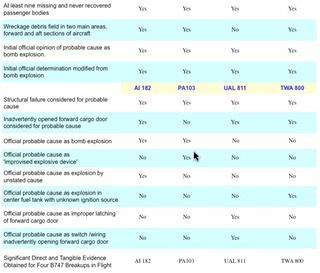 From NTSB AAR 92/02 for UAL 811: "The National Transportation Safety Board determines that the probable cause of this accident was the sudden opening of the forward lower lobe cargo door in flight and the subsequent explosive decompression. The door opening was attributed to a faulty switch or wiring in the door control system which permitted electrical actuation of the door latches toward the unlatched position after initial door closure and before takeoff. Contributing to the cause of the accident was a deficiency in the design of the cargo door locking mechanisms, which made them susceptible to deformation, allowing the door to become unlatched after being properly latched and locked." and this website, www.planetofearth.com. These sites were created by an independent aircraft accident investigator who is not affiliated with any government agency, law enforcement, attorneys, manufacturer, airline, or family victims. The probable cause for all four accidents is the shorted wiring/unlatch motor on/ruptured open forward cargo door/explosive decompression/inflight breakup explanation. EAA Newsletter December 1990, page six reference UAL 811 and PA 103. Article in Flying magazine July 1992. John Barry Smith, of Carmel Valley, California, wrote with a provocative comment on the Pan Am 103 crash. Smith points out the similarities between the damage caused by the cargo door failure of United Flight 811 over the Pacific and that of Pan Am's 103 over Scotland. Both airplanes involved were Boeing 747s and both suffered massive structural damage to the lower forward fuselage. The United flight made it safely to Hawaii while Pan Am's 747 came down in pieces. failure; but the minimal damage found on the door now indicates that an electrical malfunction probably caused electrically operated latches to open in flight. Smith points out how the cargo door opening at 23,000 feet on the United flight ripped a large hole in the fuselage and sent baggage and other debris into the number-three engine. He notes that the Pan Am flight was at a higher altitude when it suffered massive structural failure and that baggage and debris were also found in the number-three engine. He believes the greater differential cabin pressure of the higher altitude could have been enough to cause loss of the airplane if the cargo door opened on the Pan Am flight. with microscopic evidence of a bomb when in fact damage caused by thefailure of the cargo door on the United flight proves door failure could have caused the Pan Am crash. Actual bomb evidence is small and we're told finding it was one of the most astute investigative feats ever. Investigators also tell us that the bomb evidence is incontrovertible. The linchpin clue match for UAL Flight 811 to the other three is the extremely rare sudden loud sound on the cockpit voice recorder of all four aircraft implying that one unifying initiating event caused the accidents. 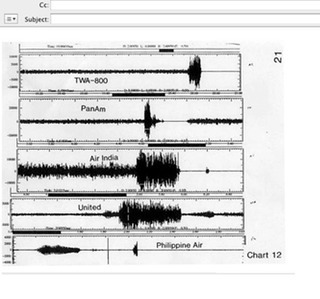 The below chart 12 is from the TWA 800 Public Docket created by NTSB and shows the acoustic analysis of the sudden loud sound on the CVR of TWA Flight 800, Pan Am Flight 103, and Air India Flight 182. The sound is not a bomb sound because of absent necessary frequencies and the rise time is too slow for a bomb explosion but the spectrum is consistent with a sudden explosive decompression which would occur with an inadvertent opening of the forward cargo door while the aircraft is in flight and fuselage pressurized. The shorted wiring/unlatch motor on/ruptured open forward cargo door/explosive decompression/inflight breakup explanation described in pictures, text, and drawings for United Airlines Flight 811, Pan Am Flight 103, Air India Flight 182, and Trans World Airlines Flight 800. Smith Aviation Accident Reports (AAR) These three AAR explain in detail the shorted wiring/unlatch motor on/ruptured open forward cargo door/explosive decompression/inflight breakup explanation and provide supporting documents, schematics, photographs, text, charts, analysis, and consideration of the other plausible explanations for the inflight breakups. All reports below are in PDF format. Official AARs for TWA Flight 800, UAL Flight 811, Pan Am Flight 103, Air India Flight 182 and Smith AARs for TWA Flight 800, Pan Am Flight 103, and Air India Flight 182 in large PDF file. 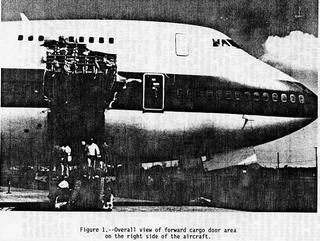 Nose comes off when cargo door goes, usually..
Pan Am 103 not brought down by bomb. Efforts to get the manufacturing defect of faulty wiring fixed and the design flaws of inadequate locking sectors and non plug cargo doors corrected by correspondence via emails. 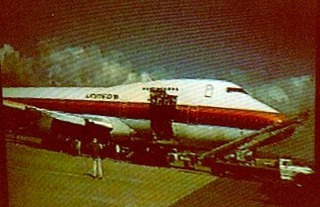 Pictures of Boeing 747s and TWA Flight 800, UAL Flight 811, Pan Am Flight 103, and Air India Flight 182 (Average 15 meg PDF files but a few are much larger. 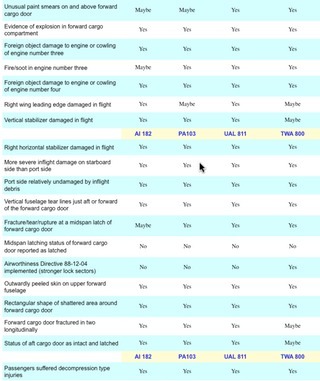 Miscellaneous information on Boeing 747, fatal accidents, hull losses, cargo data and AI 182 narrative. Wiring problems on Boeing 737 and Boeing 747s. American Airlines Flight 96 DC-10 June 12, 1972.